Getting to the Algarve. We visit the Algarve from the Costa del Sol at least twice a year. 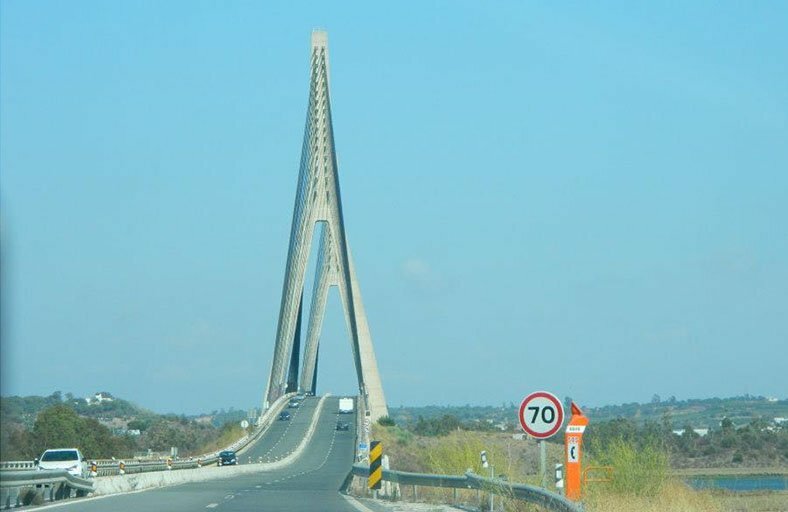 It’s an easy drive from Marbella to Lagos on the Algarve on the AP7 toll road down to Los Barrios just before Algeciras and then inland to Sevilla. Just to vary our journey we take one of three routes. On maximum alert as we skirt Sevilla to the south, climbing the big suspension bridge over the Guadalquivir river before swinging west towards Huelva then Portugal. Leaving Spain in the morning, we have the sun behind us and gain an hour entering Portugal. Leaving the Algarve in the afternoon and driving east towards Seville, we have the setting sun behind us. Our journey gains urgency as we cross the River Guadiano and lose an hour from our day. Approaching Seville in the late afternoon we can expect three full lanes of traffic heading in the same direction for some kilometres outside the city. The Algarve toll road system. Two kilometres after the bridge over the River Guadiana along the A22 / IC highway, signs invite foreign motorists to pull off the road into a drive though area to register for the automatic registration plate recognition toll road charging system. Our visit in mid August coincided with Spain’s Virgen del Carmen long weekend and well trained teams of smiling Portuguese helpers were positioned ready to explain the system. Have your credit card ready to insert into the roadside machine. As the machine registers your card a camera is also checking your front registration plate. From now on your car registration number is associated with your credit card. The machine will print you off a ticket with all details recorded on it. This is valid for a month. We have a Pagatelia Via T toll automatic toll payment card on our windscreen which we use in Spain and this also works in Portugal. If you prefer not to use the A22 toll road for your stay on the Algarve, simply drive past the toll registering area and take the first exit down to Villa Rea do Sto Antonio. You’ll join the N125 coastal road which is not metered. You will do most of your driving on the lower N125 road which joins the coastal resorts. Driving standards in Portugal are generally good. If you are driving on up to Lisbon or Oporto along the magificently empty IC 1 toll highway, then make very sure you pick up a ticket from an automatic ticket dispensing machine. You will be charged at your exit point. This system is separate to the Algarve toll roads. If you don’t collect a ticket on entry, you will be charged the full north to south transit cost, nearly €50, even if your journey on the IC 1 was much shorter. Elsewhere in Portugal, the overhead camera gantries will continue to charge your credit card automatically as you enter and leave the metered areas. The system works well and you can feel comfortable about contributing to Portugal’s economic recovery. Please don’t repeat me on that to any of locals though. Tap into my forty years of giving advice and travelling on the Iberian Peninsular by visiting the Gomarbella Travel Page.